This is a continuation of a Travel Series of my vacation to Myrtle Beach. To start at the beginning go HERE. The rest of the posts,, in chronological order are HERE, HERE , HERE, HERE, HERE and HERE..
On our last day of our Myrtle Beach vacation, we drove to Charleston. 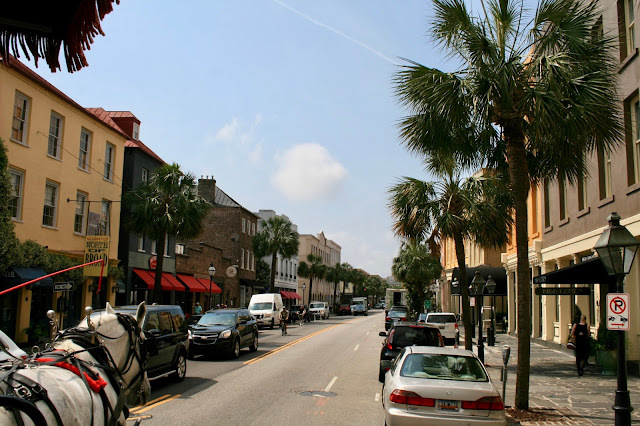 Charleston is located only 71 miles from Myrtle Beach (or an hour and half drive). We only had a few hours to spend in Charleston, as we were hitting it on our way home to Wisconsin, so I asked a worker at a Visitor's Center what was the best thing to do. She said "Take a Carriage Ride! 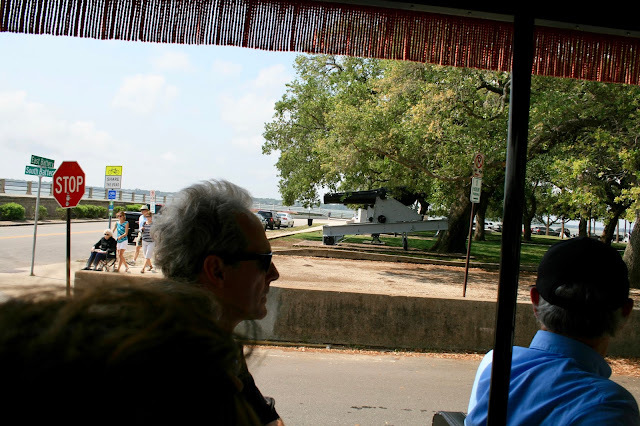 You will get a little mini tour of the area and learn a lot about it's history." 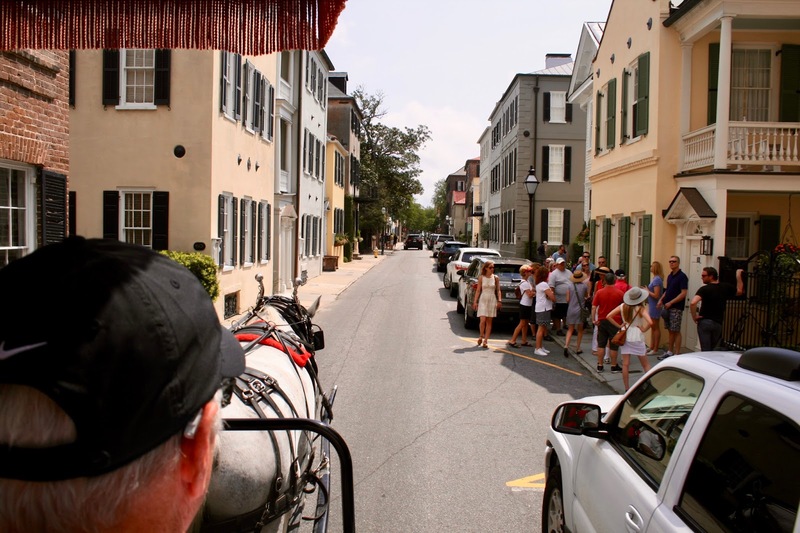 There are numerous carriage services in Charleston. We chose Old South because we had a coupon. But here's a important tip for you: buy your ticket at the Visitor Center. It is a lot cheaper than if you buy them at the site itself. We paid around $20.00 for a one hour tour. Here is a picture of our tour guide. She was absolutely wonderful: so entertaining and knowledgeable. In this photo we are "waiting" for the go-ahead to begin our tour. This is a waiting area for the carriages. Once loaded, each carriage from the various companies waits here till someone in the control room gives them their route and the go-ahead to leave (sort of like an air traffic controller). 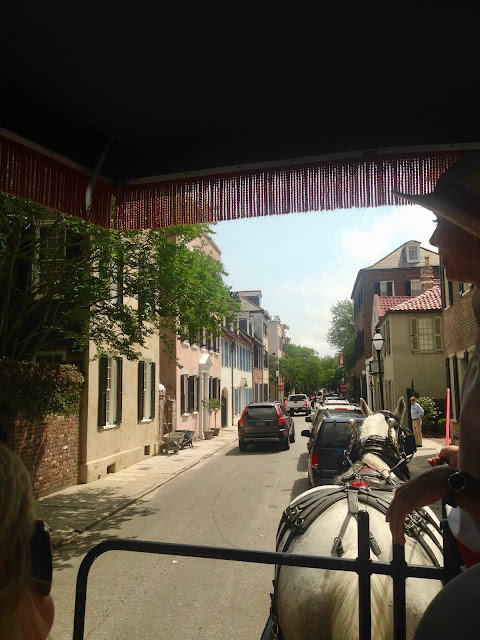 The city of Charleston only allows so many carriages out on the road at a time. When you board your carriage, you have no idea which route you are going to take. There are numerous regular routes the carriages take and the controller determines which route your carriage will take based on the number of carriages already on the routes. We were SO blessed! Our tour guide told us "We won the carriage ride lottery" because we got the Rainbow Row route! 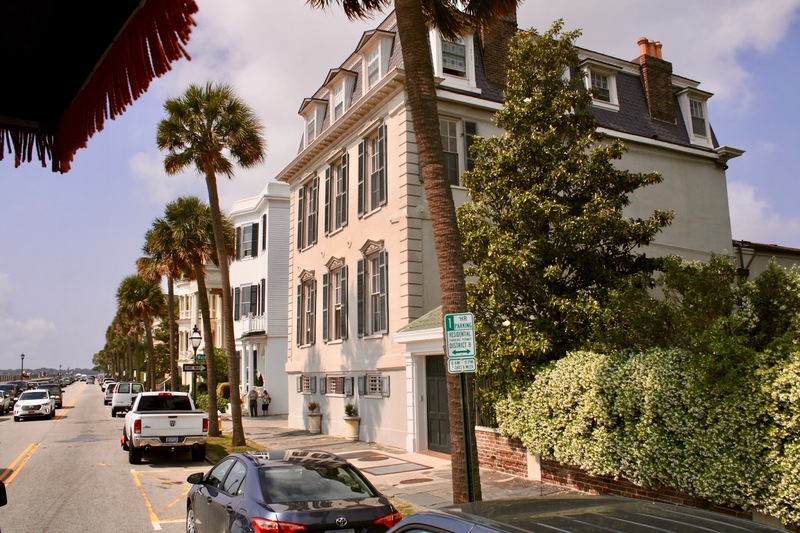 She said it was every one's favorite route of them all because you get to see all of Charleston's famous houses, beautiful streets, ocean views, and Battery Park. 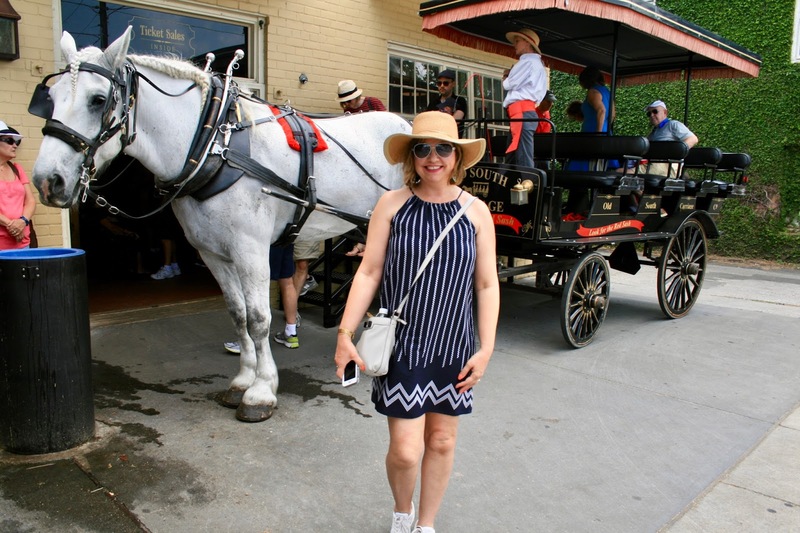 To give you an idea of the carriage ride experience, every single picture taken in this post was taken from the carriage. I will do a separate post sharing pictures we took walking around Charleston. 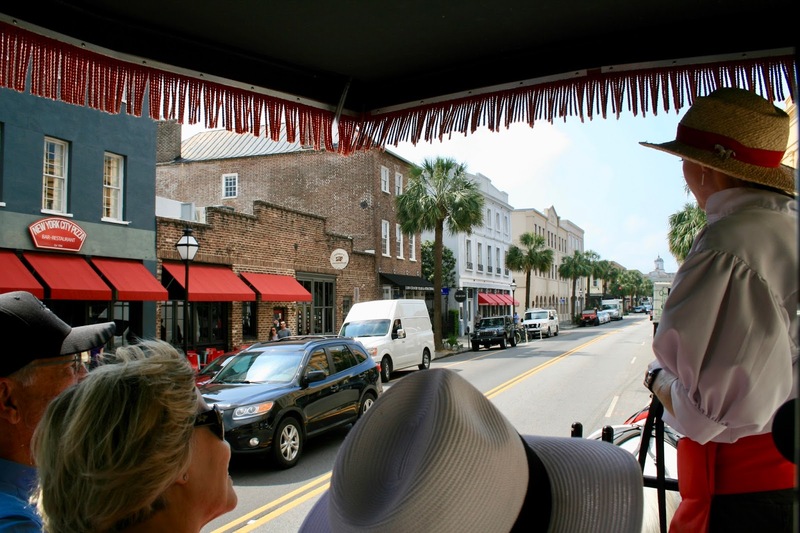 There are many different types of carriage rides provided by Old South. Ours sat sixteen people, four to a row. We were in the third row, and I think we still got some pretty good views! 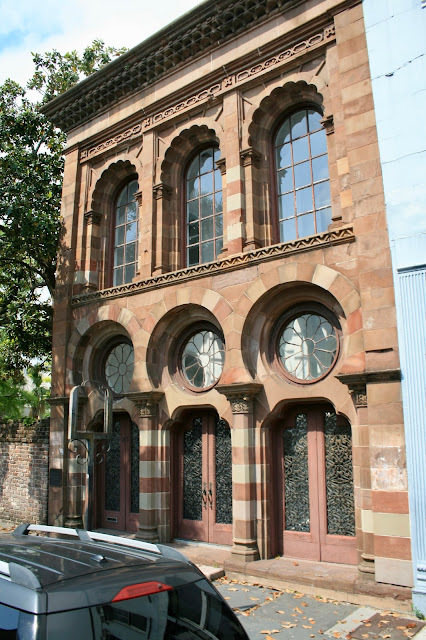 If you love old architecture, you will love Charleston. The buildings are GORGEOUS! And the palm trees lining the streets just really add to the charm. I loved all the unique pavement to the streets too. Some were brick, some were cobblestone, some were just a mix of everything. 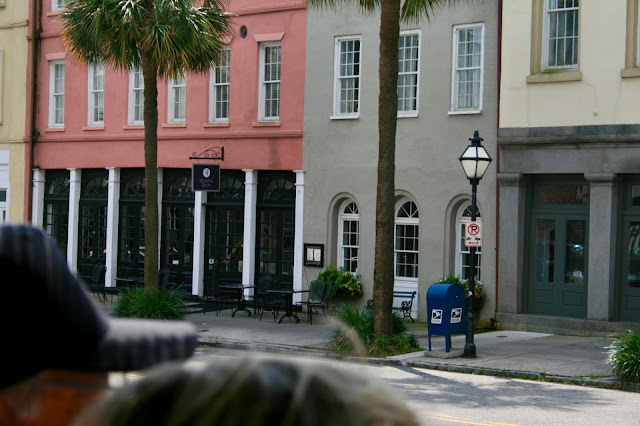 Our tour guide pointed out all the best places to eat in Charleston, like the brick smokehouse seen below. She said they had the best barbecue in town! All the beautiful color and stunning architecture in Charleston was simply breath-taking! Isn't this building amazing? I just can't believe all the detail, especially in the windows. Every time we passed a building, our guide told us about it's history. Unfortunately I don't remember any of it. I could have used a pamphlet or a audio tape as a souvenir. I always love buildings that are constructed in the shape of street corners. And here is the famous Rainbow Row....every Instagramer loves to have her picture taken on Rainbow Row. And I can see why! What a beautiful background. I had to have my picture taken here too, but you'll see that next week! The carriage route I was on took us to Battery Park where we saw gorgeous ocean views and the most breath-taking, beautiful houses I ever saw in my life! These homes were directly across from the ocean and had amazing ocean views. Every time I see homes like these I always wonder who lives here and what in the world they do with all that space? Every home had large, magnificent porches and some homes had porches on almost every single level of the home too! Battery Park had cannons and several monuments which we explored on foot later after the carriage ride. 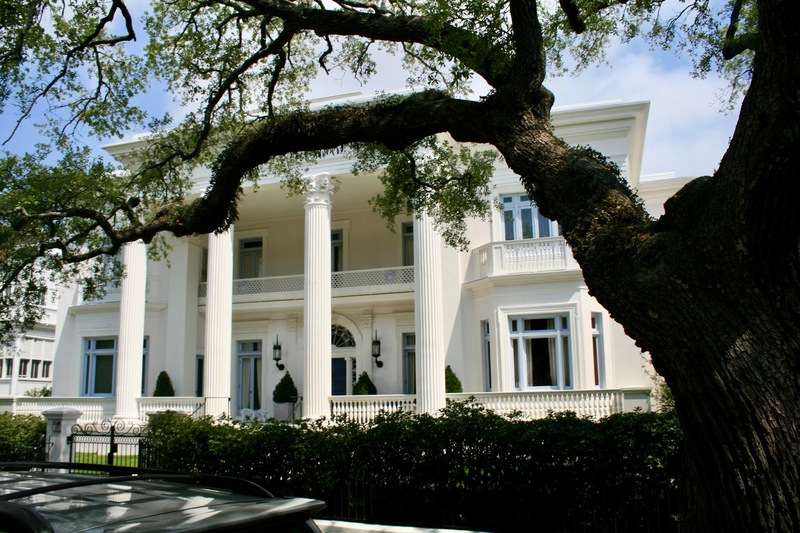 I love the columns of this antebellum home located right across the street from Battery Park. This home has an interesting story. In addition to the very unique porch and window turret, notice anything on the roof? Yes, it's the Arc de Triomphe! I don't remember the story exactly and I can't find anything on-line about the arc, but I believe our tour guide said the husband put it there because his wife loved and missed Paris...or something like that. If anyone knows more to this story, I'd love to hear from you in the comments below. 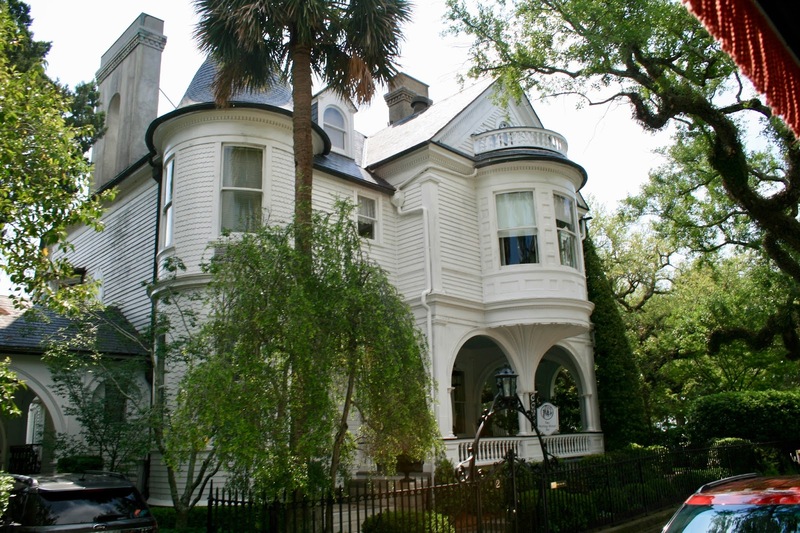 This home does have a lot of romantic history and is now a B&B known as "Two Meeting Street Inn". Some of these homes are open to the public for tours and they also have walking tours where you can get even more details about all the famous homes in Charleston. 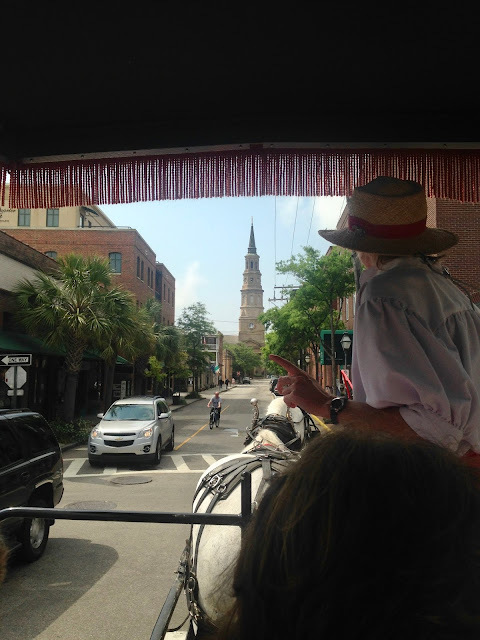 We didn't have the time to take any more tours, but someday I'd love to go back to Charleston and do that! There were so many interesting narrow streets in Charleston. It reminded me very much of Europe. Here you can see a group of people gathered for a walking tour. 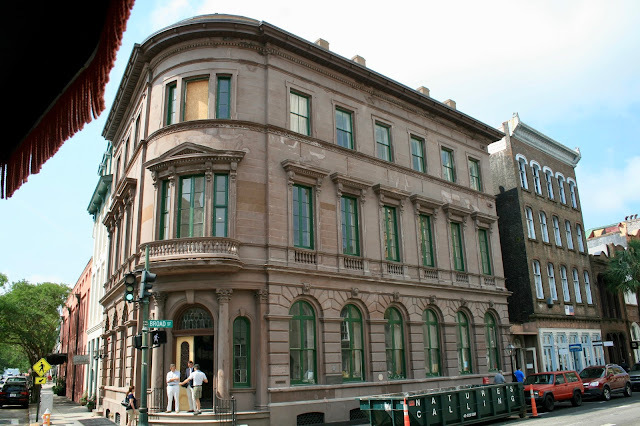 There is so much history in Charleston. Every building has a story to tell. 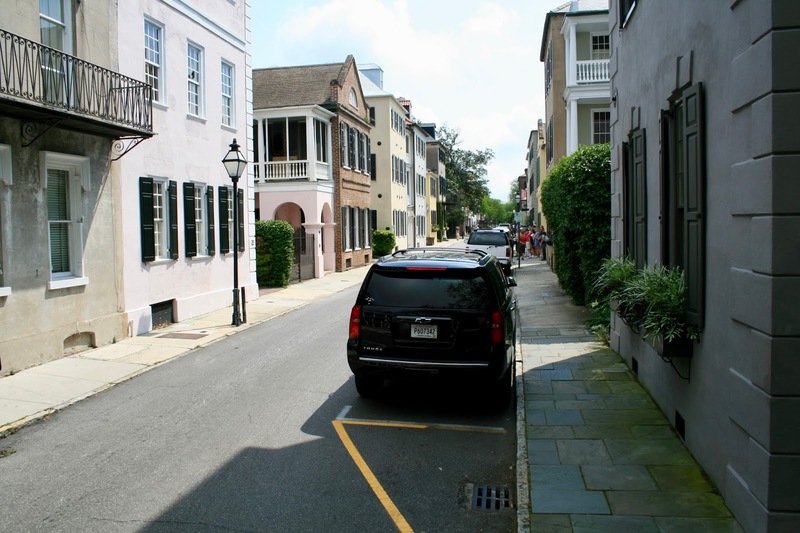 Here's an example of a cobble stone street. There were so many varieties of pavement used throughout the city. It is not a handicapped or even stroller friendly city. I absolutely loved the steeple of this old church. We really enjoyed our carriage ride. We loved our beautiful white horse. He was so good. He knew exactly where to go, when to stop...he probably could have done the entire tour without a driver. Our tour guide shared with us the history of these beautiful animals. Most come from farms where they were used as work horses. When they aren't in their prime anymore to perform hard farm labour they are sold to the carriage companies. The companies have very strict laws they have to follow to ensure humane treatment of the horses. If they are caught in violation of any law, they are heavily fined. The animals seemed very happy and well taken care of. 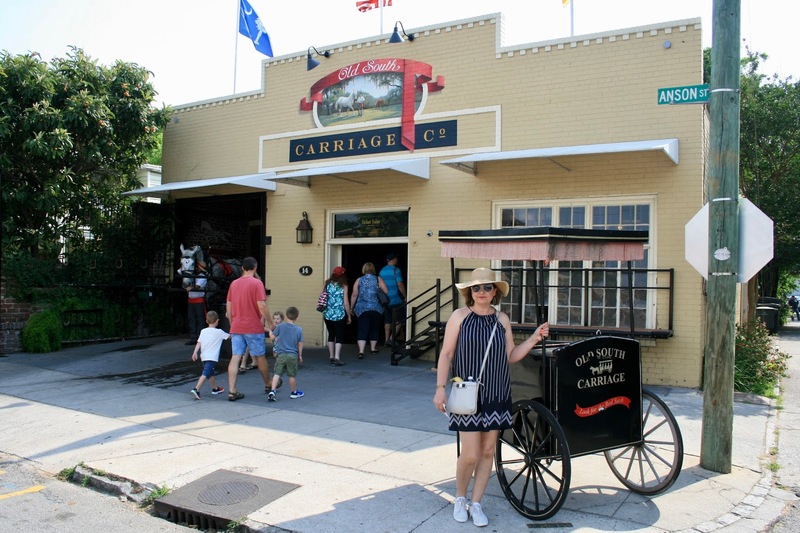 I'm so happy the employee at the Visitor Center recommended taking a carriage ride. It was the first time in my life I every took a carriage ride! We had so much fun! If you only have a few hours to spend in Charleston like we did, a carriage ride really does give you a taste of Charleston! Next week, I'll conclude my Myrtle Beach Vacation Travel Series with more pictures of Charleston as we did a little exploring on foot. Thanks for the tour, I felt I was there with you! Amazing architecture. Grateful you put in that bit about the strict control of the horses used. An open top tour is certainly the way to see Charleston, and I want to go there!!! Your SF dress looks perfect for the day and you look so pretty in it. Thanks so much. A lot of people worry about the treatment of the horses, but they do take very good of them. 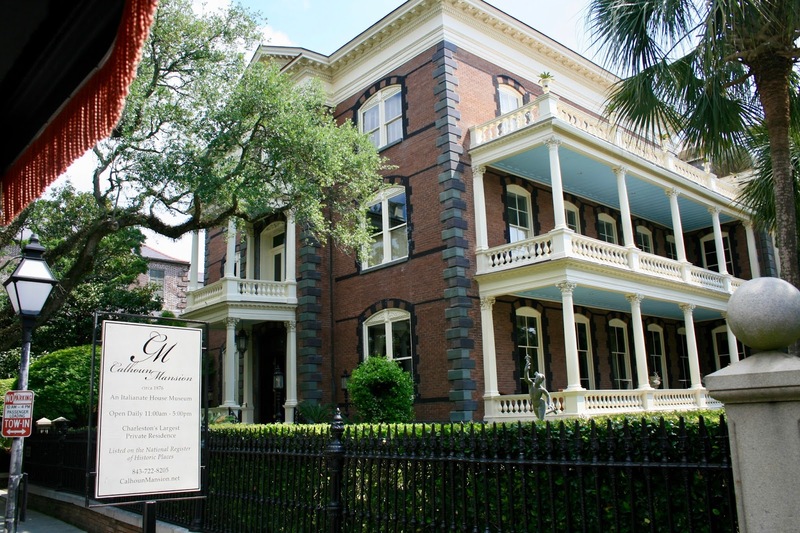 I've always wanted to visit Charleston! It looks beautiful there,and the carriage ride sounds like it was so fun. 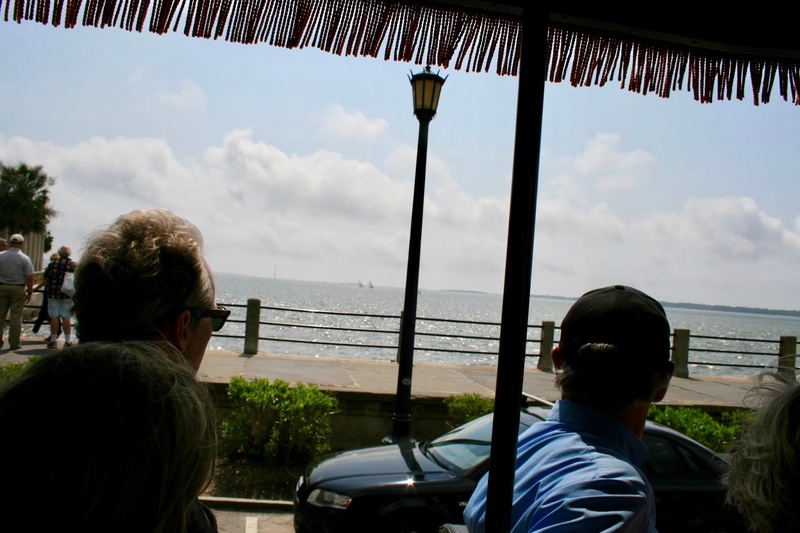 Rachael, I've dreamed of seeing Charleston my entire life. I was happy to finally see it, even if it was only for a few hours. A lovely place, I love the buildings and the sense of history there. Here in Canada, everything seems much younger, we don't have many places with that sense of time to them. Thanks Julie. I feel the same way about America as we are a young country ourselves. 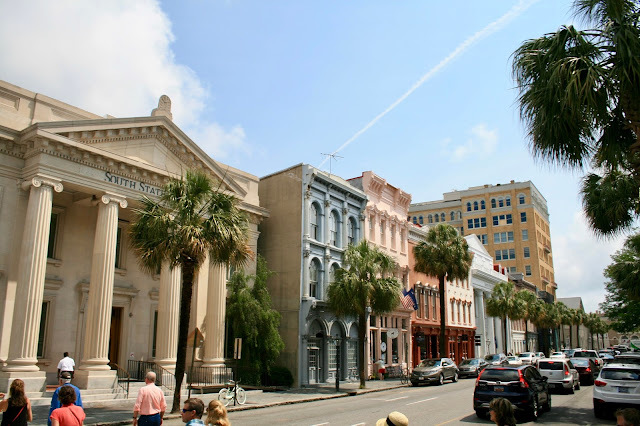 There are certain parts of the country that do have a lot of great history, like Charleston or St. Augustine. 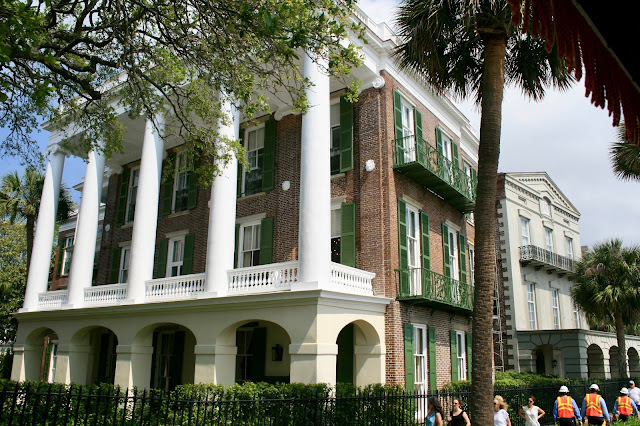 I am visiting Charleston next month and can't wait! It looks beautiful! What a beautiful city! And how lucky of your carriage to have been chosen for that specific tour! I am currently planning a self-guided walk through that area of the city, so really looking forward to your post next week! My biggest advice is to wear sneakers! They also have a free bus service in Charleston, so take advantage of that if you can. What a gorgeous dress you're wearing. 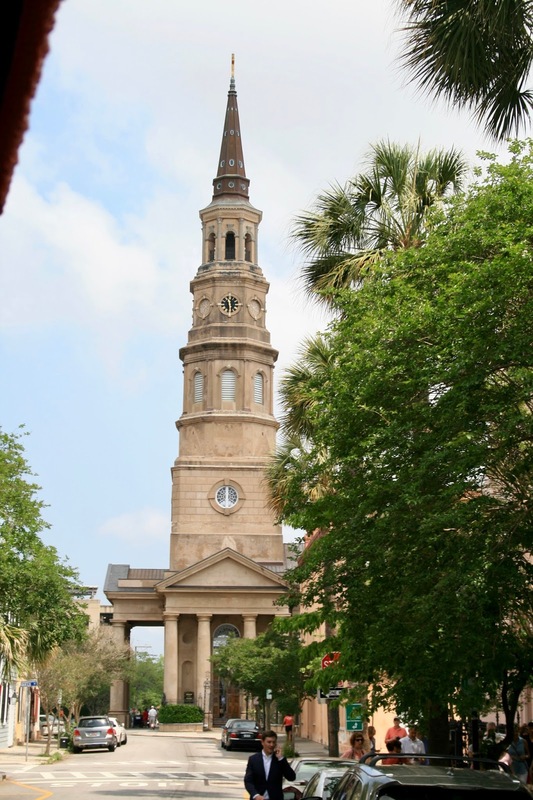 I really hope to see Charleston someday! A carriage ride sounds like a great way, but I am like you I doubt I could have retained all of the information. I've always loved building built to fit street corners, too! Sounds like a wonderful trip! Thanks Carrie! It was the one item I kept from my spring Stitch Fix. 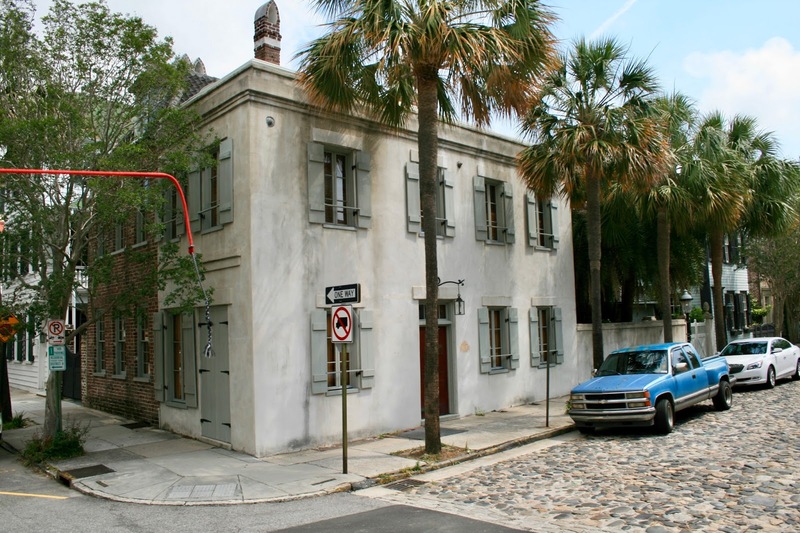 I'm sure a world traveler such as yourself will get to see Charleston soon! Loved seeing your pics of Charleston! Hubby and I went there on our Honeymoon. I think we used the exact same carriage ride. The building looks just like I remember. What a wonderful place to have a honeymoon. I wish we had more than one day to spend there. I would have loved to have seen more. This post has me so excited!! 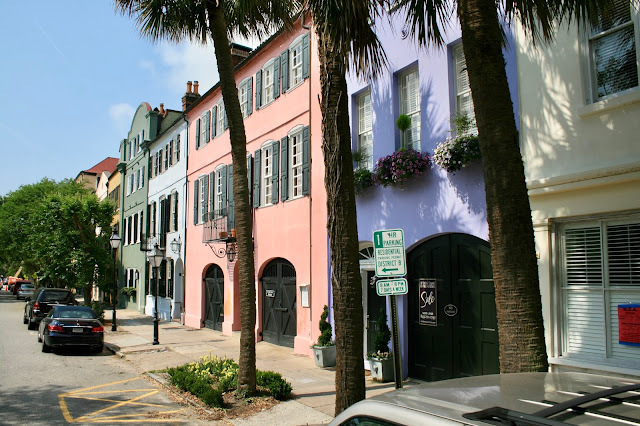 My husband and I are heading to Charleston in a few weeks as a little getaway and this looks so fun and so beautiful! Oh, you will have so much fun! 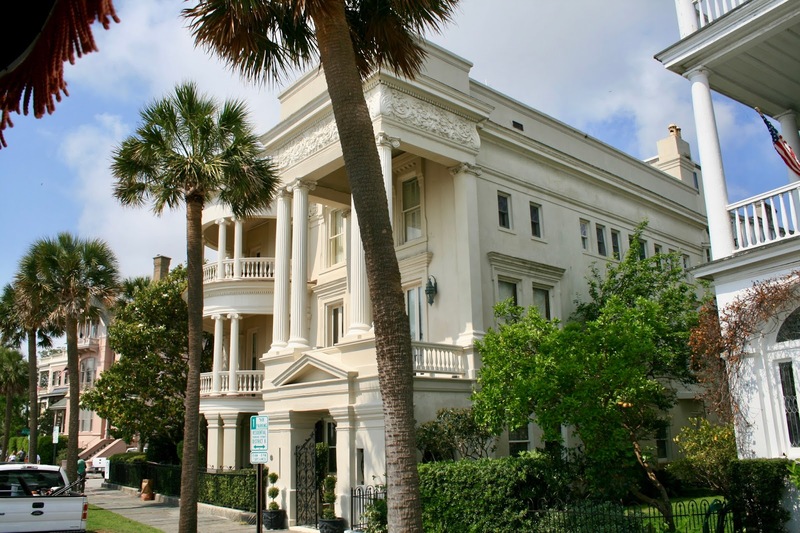 Charleston is the perfect place for couples to have a little getaway. What lovely examples of the charm of southern architecture. I have been to Charleston several times, always just to fly in and out of the country via Charleston AFB. Wish I had been able to tour this beautiful part of downtown. And a carriage ride is on my list of things to do in this life time! Well you need to do a layover next time your in Charleston because it's too pretty to be missed!